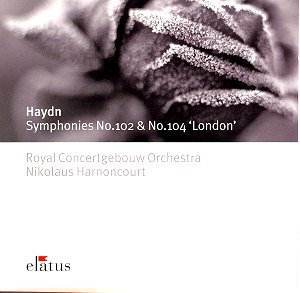 This reissue couples two of the series of Haydn symphonies that Harnoncourt recorded for Teldec in the 1980s. When first issued No. 102 was paired with No. 101 while the coupling for No. 104 was Symphony No. 103. Harnoncourt has always been a musician with an enquiring mind, a conductor who never takes anything for granted or at face value. So he is here. The performances sound to be given with a reasonably substantial band but the texture is always lean and even muscular, never bloated. The performances of both symphonies exhibit similar characteristics and a similar approach to Haydn. The B flat symphony begins with a slow introduction where Harnoncourt conveys the tension very well without overdoing things. The main body of the first movement�s allegro is driven along vigorously and with plenty of energy. Harnoncourt and his players make every accent count and use these accents to impart urgency and buoyancy. The slow movement of number 102 features a prominent part for the principal cello. The Concertgebouw player is very good here as, indeed, are the several wind players who also have prominent roles in this movement. I have to say, though, that I found the performance just lacked that last ounce of persuasiveness. This is a subjective thing, I know, and other listeners may react differently. However, when I listened to Sir Colin Davis�s fine Philips account, made with the selfsame orchestra I detected a grace and naturalness that was not so obvious in Harnoncourt�s reading. Harnoncourt is excellent in the presto finale. This is Haydn at his playful best and this performance is delightfully light on its feet. The introduction to Symphony 104 is imposing. The tuttis of the allegro are quite powerful; Harnoncourt seems to be telling us that this is a big piece. He takes the slow movement quite a bit faster than does Sir Colin (or, for that matter, Beecham) but I found the speed well judged; the music flows nicely. The finale is marked �spirituoso� and Harnoncourt�s realisation of the music certainly fulfils that demand. However, there is one big "but" about these two performances. Each features a minuet, the performance of which is bound to be controversial. The minuet of number 104 is very fast and dramatic � indeed, played like this it would not have sounded out of place in a Beethoven symphony. But this is Haydn, not Beethoven. The tempo is very definitely one-in-a-bar (with the trio sounding as if the beat is a very quick three to the bar.) The pace is hectic and I�m afraid that to my ears it sounds to be rushed off its feet. Turn to Colin Davis and you encounter a much better proportioned reading. His tempo is completely natural and, I�d suggest, idiomatic and he allows the music time to breathe, a precious commodity in Haydn. In addition the fortissimos are strong but not aggressive, as I fear they sound in Harnoncourt�s hands. Matters are pretty much the same in Symphony number 102. Again the minuet seems to be one-in-a-bar. The trio is nicely done, with some good wind solos, at an easier pace. However, Sir Colin is just a touch slower in the minuet (to the music�s benefit) and plays the trio at pretty much l�istesso tempo, which sounds just right. For some collectors Harnoncourt�s treatment of the minuets will be sufficient to rule this coupling out of court. I wouldn�t go quite so far for Harnoncourt is never less than thoughtful and, on occasion, provocative and there is always something to learn from his performances, as there is here. However, I don�t like his way with the minuets and, overall, I find his Haydn lacks the grace and geniality that is such an important aspect of this composer�s muse. It must be said that the playing of the Concertgebouw Orchestra is consistently very fine. This is an interesting pair of performances that is worth seeking out, especially at bargain price. However, though there is much about this disc that is stimulating my allegiance to Sir Colin Davis is not broken.